June 1, 2012 - Alaska Airlines on Thursday unveiled a specially painted Aztec plane with San Diego State University's logo and hallmark scarlet and black colors before a crowd of cheering students, alumni, faculty and people traveling through San Diego International Airport. The unveiling of the Bombardier Q400 was timed to celebrate the start of Alaska Airlines' new San Diego flights to Fresno, Monterey and Santa Rosa, Calif., which begin June 4 and 5. "We're proud to add San Diego State University's bold colors to our fleet of university planes and especially pleased that this aircraft represents our first California school," said Joe Sprague, Alaska Airlines' vice president of marketing. "We hope the Aztec plane will bring smiles to our passengers and be a source of pride for SDSU students, alumni and faculty for years to come as we fly it throughout our regional route network." Like other university-themed aircraft operated for Alaska Airlines by its sister carrier, Horizon Air, the Aztec aircraft was painted at no cost to San Diego State University. "Eighty percent of San Diego State's 250,000 alumni live in California, so it will be a huge source of pride for them to see the Aztec colors flying through the sky and at our local airport," said Jim Sterk, SDSU director of intercollegiate athletics. Following the unveiling in Terminal 1, fans, students and 15 radio contest winners will depart on the Aztec plane's inaugural flight along the Southern California coast, and over the Coachella Valley and Salton Sea. The Bombardier Q400 has a wing span of 93 feet, 3 inches, and measures 107 feet and 9 inches in length. The plane accommodates 76 passengers and four crew members. With a cruising speed of 414 mph, the plane can fly at a maximum altitude of 25,000 feet. A crew of eight people worked around the clock for seven days at Associated Painters Inc., of Spokane, Wash., to paint the plane. The painting required 32 gallons of white paint, 10 gallons of red paint and four gallons of black paint. In addition, about 2,000 sheets of sandpaper and 10,000 yards of masking tape were also used. 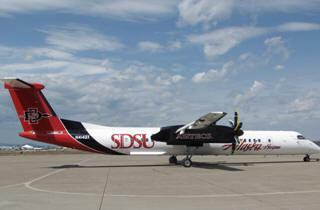 The San Diego State University plane is the ninth university-themed aircraft flown by Horizon Air since 2008. Other paint themes include the universities of Idaho, Montana, Oregon and Washington, Boise State, Montana State, Oregon State and Washington State. In conjunction with the SDSU plane's unveiling, Alaska Airlines is starting new nonstop daily service from San Diego to Fresno/Yosemite, Monterey and Santa Rosa/Sonoma County on June 4 and 5.